Review in English and SpanishThis story is about the birthday of the Infanta of Spain, a poorly raised and young princess who does not have a mother. For this reason he lives a somewhat lonely life except on the day of his birthday, but this one is so different... In this story, it is possible to see that this was one of the author's first writings because he plated many ideas that ultimately end to not be concreted. There were characters and flat plots that should not have developed, it is also full of stereotypes about the country where the story originates, which really bothered me when reading it, and the description of a 14-year-old boy slaughtering a bull did not fascinated me. However, the end was what rescued this story definitively, is one of the best finals, its’ really quite good. The truth is that for me is one of the lessons that I’ll keep in mind form now on.Este cuento trata de el cumpleaños de la infanta de España, una princesita mal criada y joven la cual no cuenta con una madre. Por esta razón vive una vida algo solitaria excepto en el día de su cumpleaños, pero este es diferente… En este relato, es posible evidenciar que este fue uno de los primeros escritos del autor debido a que plateaba muchas ideas que al final pero al final no concreto muchas de ellas. Hubo personajes y tramas planas que no debieron desarrollarse, también esta llena de estereotipos sobre todo del país en donde se origina la historia lo que realmente me incomodó a la hora de leerlo, y la descripción de un niño de 14 años degollando un toro tampoco me fascinó. Sin embargo el final fue lo que rescato este relato definitivamente de los mejores finales y es bastante bueno. La verdad es una de las enseñanzas que mas rescato y con la que mas me quedo de Oscar Wilde. A beautiful and moving adaptation of a powerful and poignant story. One of those fairy tales that just might break your heart. Another P. Craig Russell masterpiece in his series adapting the Fairy Tales of Oscar Wilde. It's so sad ..don't you think ? the way they saw him , they were the true monsters.I saw he was so kind ,pure creature and it wasn't his fault that they couldn't see how beautiful his heart was .the way he imagined how he could take care of the princess against how she saw him makes you realize how unfair the life can be . He died when he found the truth " it was he who was misshapen and hunchbacked, foul to look at and grotesque. He himself was the monster, and it was at him that all the children had been laughing, and the little Princess who he had thought loved him -- she too had been merely mocking at his ugliness, and making merry over his twisted limbs. Why had they not left him in the forest, where there was no mirror to tell him how loathsome he was? Why had his father not killed him, rather than sell him to his shame? The hot tears poured down his cheeks, and he tore the white rose to pieces. The sprawling monster did the same, and scattered the faint petals in the air. It grovelled on the ground, and, when he looked at it, it watched him with a face drawn with pain. He crept away, lest he should see it, and covered his eyes with his hands. He crawled, like some wounded thing, into the shadow, and lay there moaning. "this story literally broke my heart . "- Mi bella princesa, vuestro divertido enanillo no volverá a bailar nunca. Es una lástima, porque era tan feo que hubiera hecho sonreír al rey.- Pero ¿por qué no bailará nunca?- preguntó la infanta riendo.- Porque su corazón se ha roto - contestó el chambelán.Y la infanta frunció el ceño y sus bellos labios de rosa se curvaron en una mueca de desdén.- Para el futuro, aquellos que vengan a jugar conmigo, que no tengan corazón - exclamó; y se marchó corriendo al jardín." Oh wow. This is really heartbreaking. I'm a little bit in shock but I think I'm going to give this a reread and then probably a 5* rating. Firstly, the descriptions of everything was so vivid; for such a short story I really felt sucked within this world. Secondly, I accidentally called my mum as I grabbed my phone to write this review because I couldn't see through the tears. Armed with a sharp sword of irony, this story by Wilde will probably slice into even the most insensitive of hearts. The end brought to mind not a similar, but somehow stirring a verisimilitude of emotion , another story "The Postmaster" by Rabindranath Tagore. Though " The Postmaster" does not share the theme or the sudden end of the above story, the irony, the unfairness and the tragic brutality of emotion rend the heart alike. Though I do concede that Wilde was more intellectual and much more witty than Tagore( having gone past the bias I usually find myself according Tagore, since being an Indian, I identify more with his dreamscapes ). Coming back to the story, the Infanta is a pampered, vain little princess who on her birthday, is presented a show of dance and assorted acts by a boy, so ugly, misshapen and grotesque , that he is sold by his poor father for good riddance. Not realizing that the princess and her mates are mocking and laughing at him for his outward monstrosity of appearance, he strives to confess his love to the princess herself. But he catches his reflection in the palace mirrors, and the rest of the story just left me with the proverbial lump in my throat. Wilde explores themes of childhood cruelty, the lure of physical beauty, the insufferable pain of self-loathing and the bitter,sordid irony that is unfortunately, but very accurately a core part of life. This is the only volume of the series that is entirely occupied with just one tale (the others are two apiece), and frankly I don't think it's justified. 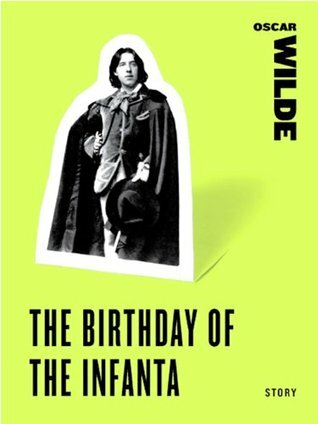 A great deal of time is spent on the festivities of the infanta's birthday party, as well as the dwarf's lounging and being mocked by wildlife, but of course this is merely a fault of the original material...and who am I to criticise Wilde? The story otherwise is slightly less cynical than, say, Nightingale... or Devoted Friend, but still a VERY harsh ending. Am I ruining my toddler by letting her enjoy these stories?The art, as ever, is stunning, and ranges from utterly cartoony to his classic-baroque masterpiece style. All of it is wonderful to look at, and helps me ignore the too-frequent typos.Right now, this is one of two of the kid's favourites from the series. We've read it twice today, and two or three times yesterday. She seems to really enjoy that there's a princess, and that the dwarf looks like the Disney hunchback. Were it up to me, she would not be reading these before she was, say, ten. But since she asks, I can scarcely justify saying 'no.' I mean, it's not Clockwork Orange, after all. It touched my heart and soul too deep. Beautiful, bittersweet and sadly, real. My only complain is that I want it to be longer. What a horrible little story. A dwarf is given to a Spanish Infanta around the time of her birthday. While it was very popular in history for royalty to have dwarfs as courtiers, Wilde goes out of his way to show cruelty and no remorse. The dwarf was brought for entertainment. The inhuman little Infanta demands for him to dance for her and his friends while they laugh at his appearance. The dwarf believes they are his friends and like his jokes and dances. It's soon after when he sees his appearance for the first time in a mirror and hears their mocking when he realizes he is a victim to their heartlessness and begins to cry. The Infanta asks the dwarf to dance for her while he is in agony and the king threatens to whip him after he falls silent. It is only when another courtier steps in do they realize the dwarf has died of a broken heart. The last we hear is the Infanta saying she only wants playmates who have no hearts. A tragic fairy tale for older children, about the lavish birthday celebrations of the Princess Infanta and a hideous misshapen dwarf who is brought to perform for her birthday celebrations. He dreams of being the companion of the beautiful Infanta, but then in the palace he sees how ugly he is in a mirror, and dies of a broken heart. Like all fairy tales, this horribly sad story is true to life. People can discuss the painful things of life more honestly in a fairy tale type story, and Wilde tells us about something we all recognize--emotional shallowness and bullying. This tale, along with The Happy Prince, show Oscar Wilde's sensitive side. Wow, I really love Russell's art style.And I love Wilde's fairy tales. This isn't my favorite (actually, I'd never heard it before and probably for a good reason)...but the art really captured Wilde's intent. Me gustó el cuento. Muy descriptivo. Y con un final muy crudo. Una crítica férrea a la sociedad. I remember how as a child this was my least favorite story because the cruelty of those spoiled kids was just too much. That poor little Dwarf! Mirrors are a terrible thing for some..
How sad :( A classic fairy tale. What a fairy tale without a happy ending. Fantastic yet believable. Well done.